"Started a low-carb diet and heard about these pancakes. Found a recipe, made them, and enjoyed them. Really great when you want something sweet and low-carb. 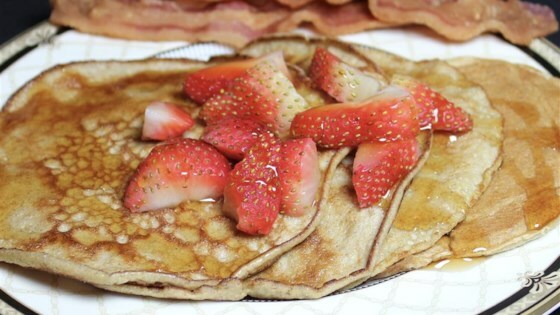 Top with your favorite pancake toppings and enjoy." Combine eggs, cream cheese, stevia, and cinnamon in a blender; blend until smooth. Let batter sit until bubbles settle, about 2 minutes. Heat a large skillet over medium heat. Pour 1/4 of the batter onto the skillet; cook until golden brown, about 2 minutes. Flip and continue cooking until second side is golden brown, about 1 minute more. Repeat with remaining batter. Substitute another sweetener for the stevia if desired. It tasted more like an omelette than a crêpe. Love these crepe-style pancakes. I leave out the cinnamon and make them to use for wraps. These have a very nice flavor, even with no toppings on them. They do turn out pretty thin, though. I used a scant 1/4 cup for each of 4 pancakes total. These were really great! Easy to make and my kids loved them. It’s a great tasting, and easy to make recipe! Made it today & LOVED it. Tasted more like a crepe but still very tasty. Will def make again!